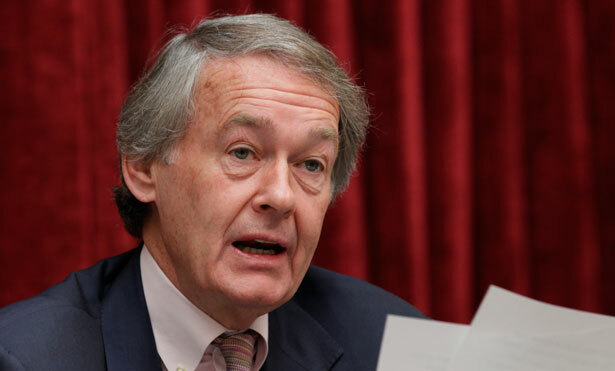 Ed Markey campaigned against cuts and won 55-44. Democrats often have a hard time winning special elections for US Senate seats in Massachusetts. But not Tuesday. Democrat Ed Markey won big. And the austerity agenda lost big. Though it is by standard measures a Democratic state, Massachusetts special elections have produced more than their share of Republican senators. Indeed, from the 1940s forward, Edward Kennedy was the only Democrat to win a special election for a Massachusetts Senate seat—the 1962 race to finish the term his older brother gave up to assume the presidency. The only Democrat, that is, until now. When Massachusetts voters went to the polls Tuesday to elect a senator to finish the term of Secretary of State John Kerry, everyone was watching the state that shocked the nation in 2010 by electing Republican Scott Brown to finish Kennedy’s last term. But there was no surprise this time. Congressman Ed Markey, the Democratic nominee, beat Republican Gabriel Gomez by an overwhelming 55-45 margin. Gomez got significant financial support from outside the state, including a boost from Senate Minority Leader Mitch McConnell, R-Kentucky, who desperately wanted a Massachusetts win to promote the notion that Republicans are on their way to a Senate takeover in 2014. Additionally, this contest played out during a period when Washington Democrats, including President Obama, were being battered by negative headlines and persistent congressional inquiries. That was tough for Markey, a House veteran who has served thirty-six years in Washington and, thus, was positioned as the “experienced” candidate at a time when that commodity is not always valued. So it was a real race. That’s what makes Markey’s win an important one. Markey and Gomez campaigned as very different individuals with very different positions on the issues. Some effort was made to pitch Gomez as a moderate who could work with President Obama, in the spirit of Brown at his most mainstream. But Markey and Gomez found little in the way of shared ground—they clashed on everything from whether Edward Snowden should be labeled a “traitor” to the threat posed by big-money influence on politics. The most fundamental difference, however, was on the question of austerity. Gomez ran as a classic proponent of austerity. He proposed to balance budgets on the backs of working families and retirees. The Republican nominee supported raising the retirement age for Social Security benefits for future retirees and he wanted to alter the formula for cost-of-living adjustments for seniors. Gomez was an ardent supporter of the “chained CPI” (chained consumer price index) scheme, which is generally seen as a strategy for cutting costs at the expense of the elderly. Though President Obama has entertained the “chained CPI” shift, Markey—like many of his fellow members of the Congressional Progressive Caucus—was explicit in his opposition to the change. Indeed, with backing from unions and groups such as the Progressive Change Campaign Committee and Progressive Democrats of America, he made that opposition central to his campaign message in the special-election race. While McConnell and Gomez tried to pitch the Republican candidate’s support for the “chained CPI” switch as evidence of his “bipartisan” commitment—an ironic message coming from the fiercely partisan minority leader—Markey was steadfast in rejecting the arguments of politicians of both parties who would undermine Social Security, Medicare and Medicaid. The congressman said pretty much the same thing in intense televised debates with Gomez, who adopted the standard DC-insider line of suggesting that he wanted to “tell you the truth” about so-called “entitlement” programs, debts and deficits. The truth, of course, is that there are many ways to balance budgets. Wealthy campaign donors who would prefer not to surrender their advantaged positions when it comes to tax policies, and corporations that do not want to face reasonable regulations or basic accountability, would prefer to shift the burden toward working Americans and the elderly. That was the austerity peddled by Gomez. Working Americans prefer investments in infrastructure and job creation, fairer taxes and guarantees that earned benefits will not be threatened. That’s the growth agenda that’s at odds with austerity, and Markey embraced its core themes. It was this debate over basic economics that defined the Massachusetts race. The choice that voters rendered Tuesday had less to do with the candidates than with sentiments regarding an approach to balancing budgets that errs on the side of fairness or on the side of ever-expanding income inequality. Ultimately, that is what the austerity debate comes down to, and the austerity debate is what the Markey-Gomez race was all about. While voters in Massachusetts were deciding between Markey and Gomez yesterday, the Supreme Court had a vote of its own: to strike down a key section of the Voting Rights Act.